Louis Armstrong Park is a 30 acre park featuring several sites and sculptures related to New Orleans music history. The main pedestrian entrance is on N. Rampart at St. Anne Streets. The shady landscaped space to the west (towards Canal St.) is historic Congo Square, where enslaved persons, free persons and color and Native Americans gathered on Sundays during the colonial and early American periods to trade, perform music and dance . Elements of improvisation, African rhythm patterns, and use of string instruments became incorporated into early jazz. On the edge of the lagoons to the east (towards Esplanade Ave) are sculptures of New Orleans music icons. Buddy Bolden who reigned as the first "King" of cornet from 1900-1907 is portrayed as three persona in motion, possibly reflecting his unstable mental state. Louis Armstrong' larger than life statue created by esteemed artist Elizabeth Catlett, pays tribute to the King of Jazz in the twentieth century. Further to the north is the bust of Sidney Bechet, the great creole of color clarinetist and peer of Armstrong in New Orleans during the 1910s. Beyond this grove Mahalia Jackson, considered the greatest gospel singer of the twentieth Century, is honored in a modern sculpture and the adjacent Mahalia Jackson Theater for the Performing Arts. Across the lagoon to the east (towards Esplanade Ave.) the Perserverance Hall/Masonic Lodge #4 (Society Hall) is typical of many society halls rented out for dances in the 1910s. During this period, jazz musicians including clarinetist/saxophonist Sidney Bechet and bassist George "Pops" Foster played dances there. The first floor would be rented out for public events to produce income for the lodge, and the upper floor was used for lodge rites and dances. Captain Verne Strekfus, who owned a line of excursion riverboats, recruited talented musicians such as Pops Foster from the dance bands. Built in 1820, this Scottish Rite masonic lodge is one of the oldest in the United States. 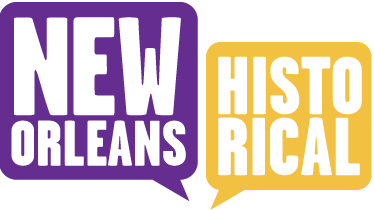 French-speaking white immigrants from San Domingue who moved to New Orleans following the Haitian Revolt founded the lodge in 1810. The lodge was situated at the corner of St. Claude Avenue and Dumaine Street, an intersection made famous in Professor Longhair's 1949 hit "Go to the Mardi Gras" as the location where one can "see the Zulu King." The city developed Louis Armstrong Park in the 1960s and 1970s in an urban renewal project that destroyed a section of the Treme community, considered to be one of the oldest African American neighborhoods in the United States based on the large number of free person of color land owners in the early 1800s. Like the French Quarter, the Treme was largely an Italian and African American community by 1900, and produced the great New Orleans trumpeter/singer Louis Prima, who modeled his style on Louis Armstrong. 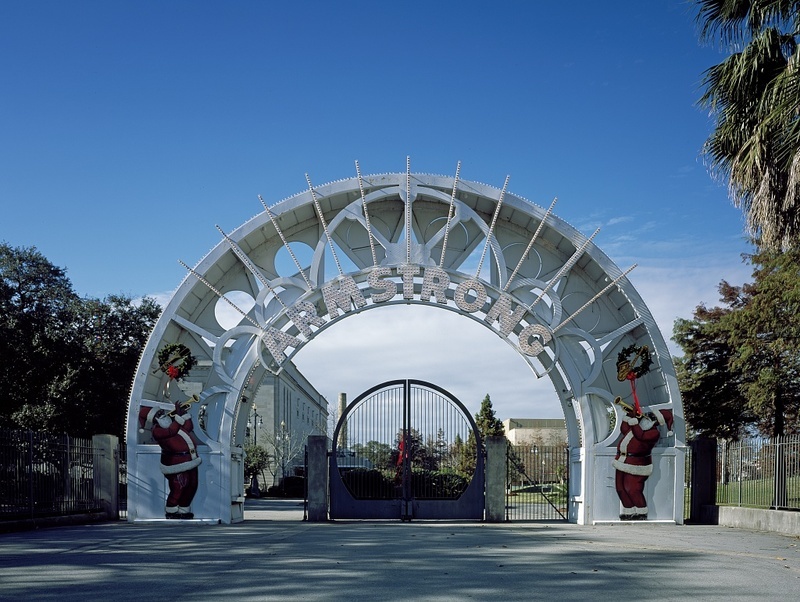 "Entrance arch to Louis Armstrong Park in the Treme neighborhood of New Orleans, Louisiana." ~ Source: "Retrieved from the Library of Congress, <www.loc.gov/item/2011632995/>. ~ Creator: Carol M. Highsmith, photographer. "When the Saints Go Marching In," recorded at the Mahalia Jackson Theater. Alahna Moore, Charles Chamberlain, “Louis Armstrong Park,” New Orleans Historical, accessed April 24, 2019, https://neworleanshistorical.org/items/show/1328. Armstrong Park honors the local jazz legend and features public art works and historic sites related to the earliest development of jazz in New Orleans..